Nestled at the gorgeous Great Marsh Estate in Bealeton, Virginia, this Tuscan-inspired styled wedding imbues the senses with its nod to the rich characteristics of Italian culture. Gold touches pair with deep red hues, artisanal foods, and lively blooms to bring a Tuscan touch to this private mansion in the countryside. The invitation suite boasts old world charm with its torn, textured parchment, hand-drawn map of Tuscany and bespoke calligraphy. 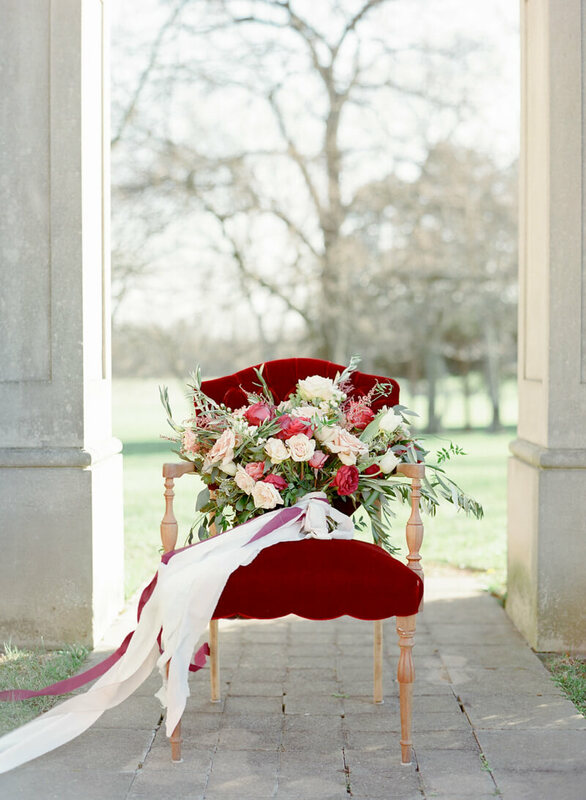 Deep wine colors abound throughout many aspects of the shoot, including a velvet chair, which showcases the bridal bouquet. Assorted red, pink and white flowers, hypericum berries and Italian ruscus all combine under the simple gathering of white and wine silk ribbons for a fitting, texture-filled arrangement. The bride looks classic in a tulle ball gown that features a modern neckline. She accessorizes her updo with an ultra-long veil and a darling gold floral headpiece. The groom cuts a timeless figure in a sharp black tuxedo, complete with a boutonniere fashioned from white hypericum berries and greenery. The happy couple admires the sunshine, and each other, from one of the estate’s courtyards along its 121-acre property. The bride removes her veil to show off her gorgeous updo and headpiece as she pauses for a photo with the groom. The framing of the stonework behind them and the inclusion of the velvet chair makes for a classic picture. They hold hands at their courtyard ceremony spot where the sun begins to set over the horizon. With bridesmaids dressed in wine-inspired colors on the left and a group of groomsmen in coordinating black tuxedos on the right, the entire bridal party is a gorgeous gathering of friends and loved ones for this couple’s elopement. For a modern touch, bridesmaids carry gold geometric lanterns with small flowers tucked inside. The reception table is beautifully set with both modern and classic accents. And of course, the bride and groom find their seats easily thanks to two olive leaf wreaths. The gold detailing, such as these modern gold-rimmed plates, is an intentional touch because it pairs effortlessly with the wine-inspired colors of the wedding. A simple draping of a white table runner and white chairs add softness to the tablescape, while gold candlesticks and a plush floral arrangement enliven the design. An artisan cheese plate awaits everyone in attendance as they settle into their seats. 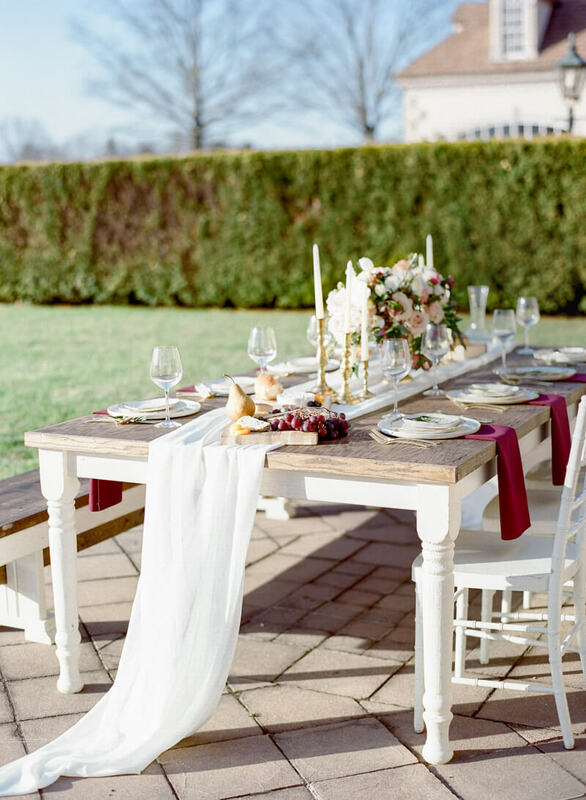 The group toasts the happy bride and groom, and share in the delicious flavors and aromas of Italian food and wine at this treasured Virginia estate. 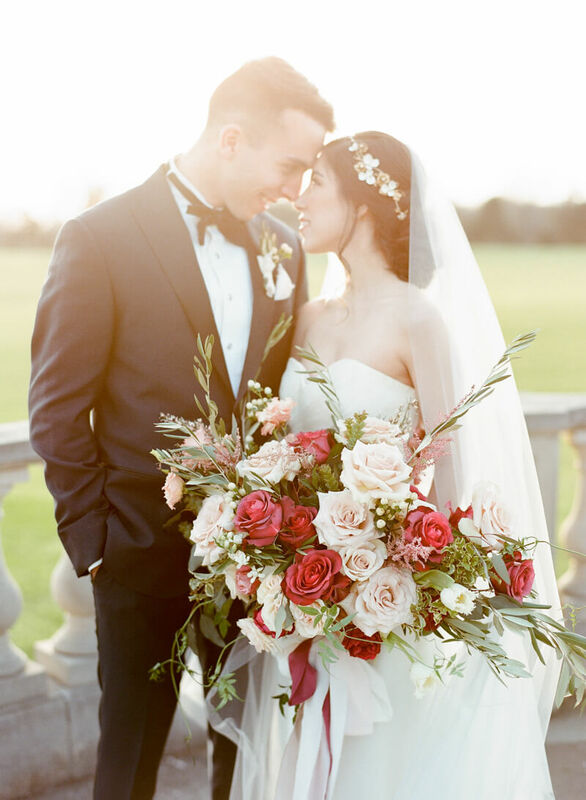 A Tuscan-inspired wedding inspires us all to celebrate the cultures and traditions we cherish wherever we are, with whomever we choose – no passport required. Drink in the possibilities of what your elopement could be and use details you know and love to bring the experience to life.